We have a mailing list of people looking for the various Slumber Babies. In fact we had two people ask for help finding the yellow lamb about the same time. Linda and Lynda have now found one, but others are still looking. 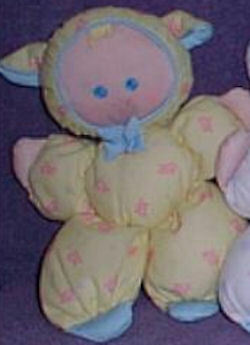 I’m looking for a Fisher Price yellow Slumber Babies lamb. Linda writes: My daughter had one of these when she was around 2 or 3. She couldn’t say her L’s very well, so she called it her “Yeyyow Baby”. I think we left it in a hotel room in Florida (I live in Louisiana), but when I called the hotel, they weren’t able to locate it. My daughter is now 21 and she still talks about her “Yeyyow Baby”. I would love to be able to find one for her and surprise her with it. I’ve seen a couple on eBay, but they’re supposedly very rare, and the ones I saw had already been sold. And Lynda writes: My daughter has had a Slumber baby lamb since the day she was born. She has having some health problems and would love to have a new Fisher Price Slumber Baby Lamb to have for her hospital stays.